Karasu, a Brooklyn restaurant designed by Space Exploration, recently opened in Fort Greene with deliberately little fanfare. Entering the dark, seductive space, one immediately feels transported to another place, namely one that's perfect for a late night cocktail. Besides New York restaurants like Walter’s, Hamilton’s Soda Fountain and Glasserie, Space Exploration is also known for its work designing residential projects in New York, Montauk and Miami. WorkOf caught up with Kevin Greenberg, the founder of the architecture studio, to chat about his new project and his approach to design. First I'd like to talk about your most recent restaurant project. It’s a bit of departure from some of your other work, but still has your some of your signature elements. Tell us about Karasu. Karasu is a restaurant in Fort Greene, Brooklyn. It's adjacent to Walter's, which we also designed, back in 2012. The two restaurants are owned and operated by the same business partners, but Karasu is a separate restaurant, with its own concept and its own identity. It's smaller than Walter's, and darker, and its entrance is at the back of Walter's — you have to pass through Walter's to enter Karasu, so we knew from the beginning that the the relationship between the two restaurants was very important. The fact that Karasu is modeled on a Japanese izakaya, or drinking restaurant, provided the starting point for the aesthetic we developed. That said, the owners didn’t want the overall aesthetic to feel explicitly Japanese. Their chief concern was that the design should have a dialogue with Walter’s, so we looked at the details we had employed there as a place to begin. We wanted Karasu to have a similarly timeless feeling, but with a more pared-down, modern language that would evoke Japanese aesthetics. Your design work went beyond the visual elements of the space; you even picked the record collection for Karasu, as well. Tell us about that. Karasu's owners were very generous with the breadth of control they gave us over designing the experience, and that included the soundtrack, which was a treat for me, because I feel like the experience of a restaurant should engage all five senses, and we rarely have a say in the auditory component of the design. I love jazz and collecting records, so I jumped at the chance to help choose the soundtrack. From very early on, I felt strongly that it should consist primarily of "hot" jazz from the 1950s and 1960s — sophisticated, uptempo, post-bop albums that still sound great today. 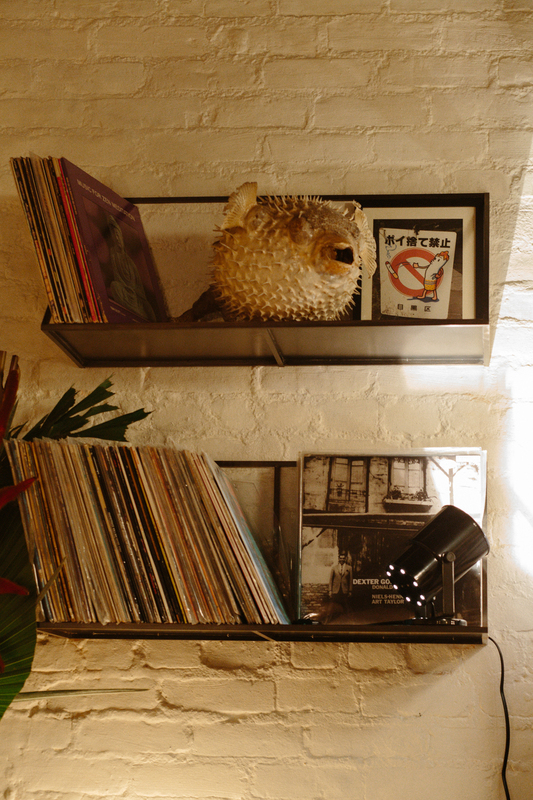 I feel like the record collection is a nice complement to the other elements we chose: the lighting, the materials, the colors, and so on. Karasu is much darker than other spaces you’ve designed. In fact, it barely has any windows at all. What sort of challenges did the space present? The space was previously a chiropractor's office. It was divided into several small treatment rooms with a reception area, and access was through a side door on the Cumberland Avenue side. Once we demolished the partitions, the space was the typical dusty blank slate, but the splayed shape of the envelope complicated matters. We already knew the geometry well, since we first encountered those odd angles when we designed Walter's. Our goal was to deemphasize the odd shape of the room, so we had to be sensitive about parallel relationships between objects, millwork and walls. Many decisions about the experience of Karasu were predicated on the fact that one enters it through a narrow corridor at the back of Walter's. Because it is a single, modestly-sized room, we were focused from the start on creating the right kind of entrance to the space, the right arrival. We introduced ceiling height changes to carefully frame the initial view you get when you first open the door, and similar changes in the floor and ceiling heights to mark the secondary spaces. The lack of natural light never concerned me. I might have been concerned if Karasu were a restaurant that focused on breakfast, but it's meant to be a secret, seductive, late night spot, illuminated by a dim, warm glow. In most cases, an abundance of natural light is the best design partner you can have — it accentuates the details you want to showcase, yet paradoxically it often forgives the flaws you want to conceal. With two walls of windows, Walter's is awash in natural light, and our design for that space seeks to make the most of it (although it works at night, too). At Karasu, we worked against the light. While we were designing Karasu, I thought of it as a yang to the yin of Walter's: although Walter's incorporates a lot of dark colors, their use is restrained; it is primarily a bright, light space. Karasu is its complement: we deliberately sought to make it dark, to accentuate the depth of the shadows. Elements that might feel dark at Walter's, like the friction-fit cedar kumiko screens, feel light in Karasu. 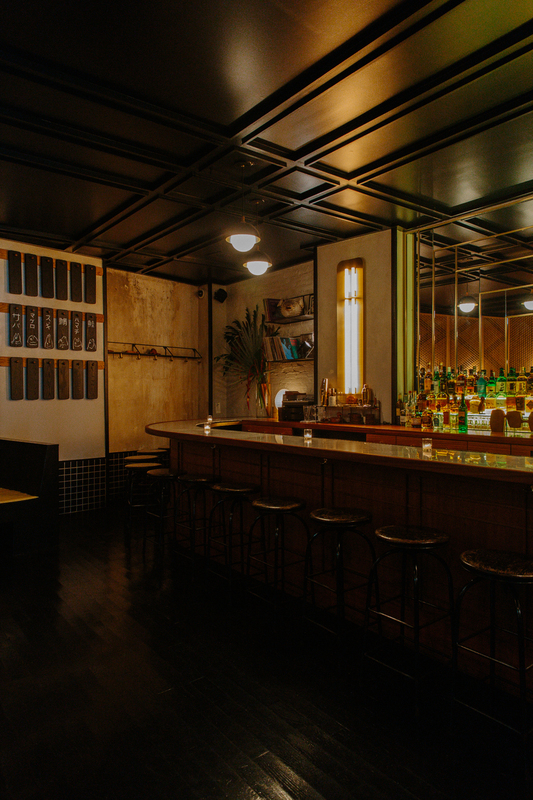 The two restaurants are book-matched, for example the bar of each restaurant is mirrored in plan, and that was by design too, to emphasize the notion that Karasu is a dark twin to Walter's, and is integrally interconnected, like a dovetail joint. Can you describe the process overall of designing Karasu? How long did it take? What was it like to work with the owners? From concept to completion, the project took about 14 months. The owners are among my favorite clients, and after five years of working together on a range of projects, I feel lucky to now count them as good friends. Karasu is Space Exploration’s fifth project with them. In addition to Walter’s, we designed apartments for each of them in Brooklyn, and a home for one of them in Montauk. They see the importance of being fastidious about every detail of the design. Together, we looked hard at everything — every color, texture, sheen, and proportion. Working with good clients is always collaborative, and that was very much the case at Karasu, from the broad strokes of the design through to the smallest touches, like the coat hooks and the profiles of the table tops. Did your time in Japan influence the design? Were you thinking about authenticity or attempting to stay true to a certain style? I lived in Japan for a few years, and I really admire Japanese aesthetics, so designing Karasu presented a great opportunity to employ some of the traditional Japanese motifs, patterns and textures that I love. But as I mentioned earlier, we didn't want Karasu to feel like a pastiche of faded Japanese design strategies, or worse, like a cheap sushi joint. We wanted it to have a refined, understated feel with nods to mid-century modernism. Since traditional Japanese architecture exerted a great deal of influence on early modernism in the West, we studied the details, material composition and proportions of places like Katsura Imperial Villa and Ise Jingu-Mae. We were also inspired by important mid-century Japanese interiors, like the lounge at the Okura Hotel in Tokyo, which sadly was recently demolished. More inspiration came from classic post-war Japanese films like “Pale Flower,” and the cinematography and interior design of Yasujiro Ozu’s early color films. Can you tell us about the particular elements you used in the space? Are there any brands or fabricators you'd like to mention? Most elements of the space were built custom for Karasu. Space Exploration designed the linear sconces at the bar with help from Mitchell Dose, a talented metal fabricator with whom we often collaborate, and who also built many of the other metal elements in the space. Pendant lights were sourced from Allied Maker, Artek, and Rich, Brilliant & Willing. The smaller sconces are by Workstead. The friction-fit cedar kumiko screens were assembled and supplied by Tanihata in Tokyo; the overall design was ours, composed of two separate traditional patterns. The bar is mahogany, and was fabricated in Williamsburg by Sons & Co. The bar top is a honed marble called Bardiglio Lucca. Most of the paint is by Farrow & Ball (we used their "Floor Paint" sheen on the ceiling and banquettes), as is the wallpaper in the bathroom. Tile was supplied by Heritage Tile. The vintage boro fabric separating the kitchen from the bar was supplied by Sri Threads, on Eckford Street in Greenpoint. Most of the glassware and tableware is vintage. One of your signatures, at least for the residences you design, is staying true to original details as much as possible and then building off of that with some modern touches. Is that a fair way to describe your style? Can you describe why that’s important to you? I'd like to think that our work has less to do with a "style" and more to do with attempting to be in tune with the spirit of a place, and the construction vernacular of that place, and its history. When we design in Miami, for example, our inspirations and the resulting design language is very different from when we design a house in Montauk. Most of our work in New York involves creating interventions within existing fabric (although we certainly wouldn't say no to a new ground-up hotel or museum!). There's a thick accretion of history in New York's built environment, and having respect for that history is at the forefront of my mind when I'm designing a space here. Architecture is a grammar with formal rules, and that's very plain in New York. Historical buildings in New York are very cogent and articulate; I believe their architects wanted them to be read like a sentence, or a poem. I also believe that you can sometimes break the rules of architectural grammar, but you have to understand them first. For me, it's liberating and enjoyable to adopt that grammar and work within it, and to occasionally, respectfully, deconstruct it.